"The South's Got Something to Say"
The Center for Civic Innovation is thrilled to announce our full class of 2019 Civic Innovation Residents! Now in its second year, the Civic Innovation Residency is a one-year intensive leadership and business development program for civic entrepreneurs in the greater Atlanta-area. The 12 individuals selected for the Residency program run enterprises with products, services, and programs focused on solving issues of inequality in Atlanta. During this 12 month program, Residents will work on scaling and sustaining their social impact and strengthening their leadership and operations to get there. In addition to monthly intensive training sessions and one-on-one coaching, each Resident receives work space and up to $25,000 of investment that goes toward their business and leadership development. 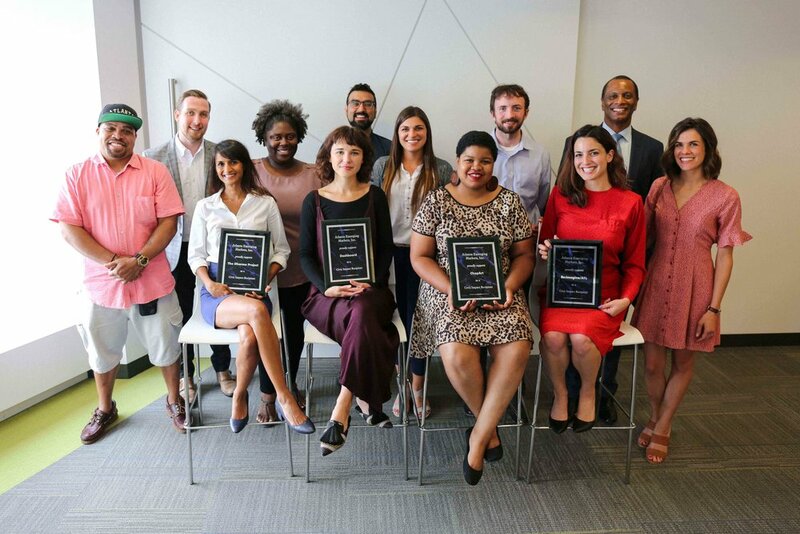 Ten of the 12 participants in the Residency are graduates from the Center's 2018 Civic Innovation Fellowship program, a six-month leadership and entrepreneurship program focused on testing the early stages of ideas and ventures in the social sector. Alex Acosta | Soul Food Cypher: Utilizes the power of freestyle rap and lyricism to transform the lives of individuals and their communities. 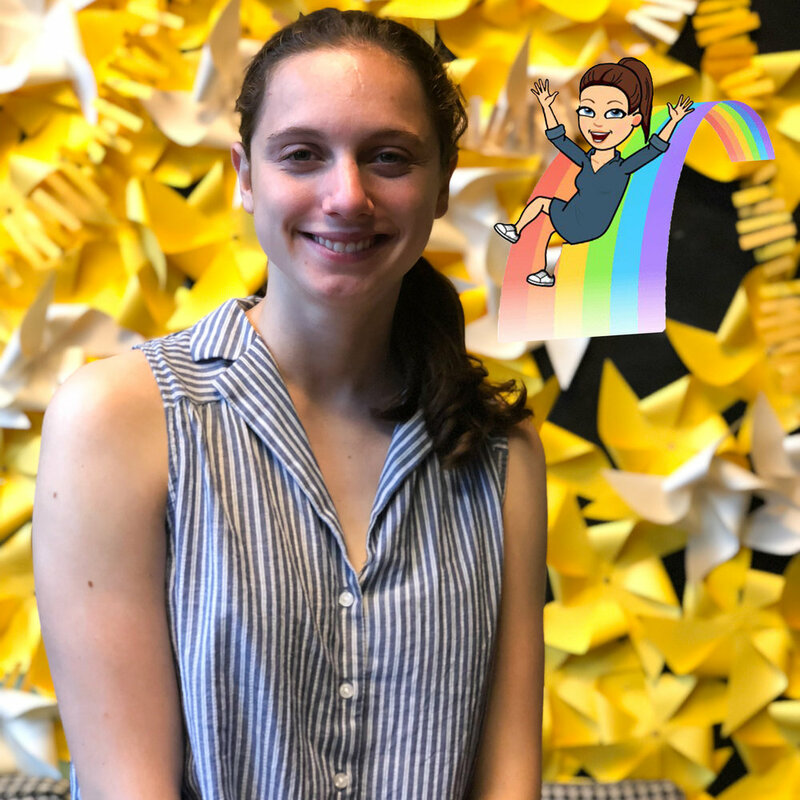 Sam Aleinikoff | College AIM: Supports students in Metro-Atlanta on their paths to and through college by building sustainable college-going cultures within school communities. Marcus Blackwell | Make Music Count: Increases elementary and secondary students’ mathematical skill development through piano playing and reducing their math anxiety. Terri-Nichelle Bradley | Brown Toy Box: Inspires black children to pursue careers and hobbies where black people are typically underrepresented. Nedra Deadwyler | Civil Bikes: Curates culturally connected and relevant stories to engage people with place. Jenn Graham | Civic Dinners: Uses technology to bring diverse people together to break bread and have a structured conversation that builds empathy and trust. John Kennebrew | Showcase Group: Strengthens and empowers families involved in the juvenile justice system through social and emotional interventions, and by using STEAM. Tiffany LaTrice Williams | TILA Studios: Empowers black women to create and showcase their art. Trish Miller | SwemKids: Aims to eliminate negative perceptions and barriers to swimming proficiency for black children and their families by equipping them with the skills to have a healthy and safe relationship with water. Samantha Watkins | Urban Perform: A non-profit organization making exercise accessible and affordable to the underserved communities of English Avenue, Vine City and Washington Park in Atlanta. All of the women in the program are supported by the Sara Blakely Foundation, which has a strong commitment to investing in women entrepreneurs in Atlanta. After the program, the Civic Innovation Residents become eligible for additional flexible capital for operations and impact growth through the Center for Civic Innovation’s Civic Impact Fund, which is run in tandem with Invest Atlanta and the Sara Blakely Foundation. — Spanx founder and CEO, Sara Blakely. After the program, all Civic Innovation Residents will become eligible for additional flexible capital for operations and growth through the Center for Civic Innovation's Civic Impact Fund, which is run in tandem with Invest Atlanta and the Sara Blakely Foundation. The Center for Civic Innovation was established in 2014 in response to Atlanta national designation as the country’s most unequal city. Since then, the Center’s focus has shifted to hosting community conversations about city-wide challenges, investing in new ideas with the promise for better outcomes and influencing public policy by advocating for and demonstrating better channels of engagement between residents and policymakers. Since its creation, the Center for Civic Innovation has invested more than $1.5M in almost 70 new ideas led by local civic entrepreneurs. Investors in this program include: the Sara Blakely Foundation, the Kendeda Fund, MailChimp, the Arthur M. Blank Family Foundation, Chick-Fil-A Foundation, Equifax Foundation, and the United Way of Greater Atlanta. The intention is to invest in community-driven leaders with high-potential products and services that tackle deep-rooted issues in Atlanta. 2019 Residents are focused in the areas of art/culture, education, workforce development, food security, and civic engagement. 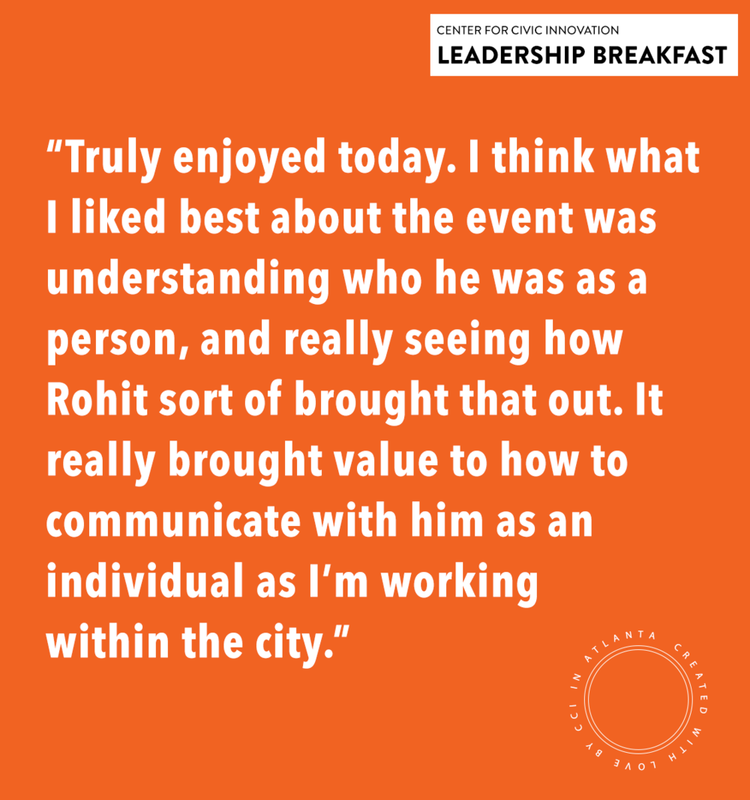 This morning, our executive director Rohit Malhotra sat down with Rashad Taylor, the Chief Equity Officer of One Atlanta, the Mayor's Office of Equity, Diversity and Inclusion. Couldn't make it? 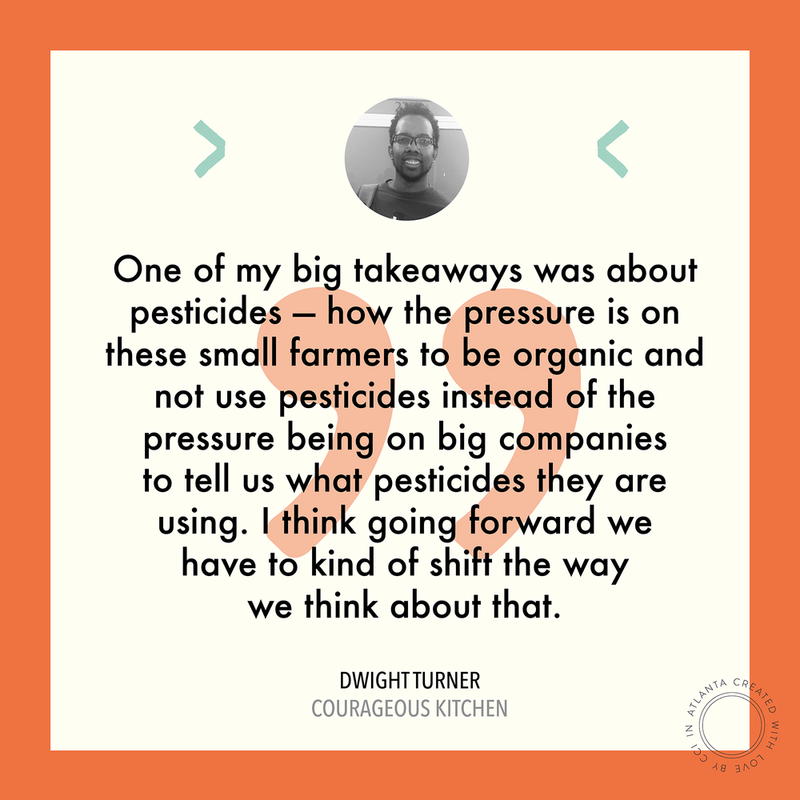 We've got you covered with five of our favorite quotes from the talk this morning. Go on, get inspired. "In terms of robust community engagement, that hasn’t started yet, but that’s definitely something we gotta do. We can’t do this work if we’re not guided by what the community needs." "I kind of see myself as a little bit of a disruptor. The most exciting work has been working with TI and others who want to get involved in the housing space, the education space." "Politics is a contact sport, and it's never been an easy conversation, and most politicians that I’ve worked for wrestle with it." "I ran, I won, and it was one of the best decisions I made. It’s hard to break into Atlanta politics if you’re not from Atlanta. The good thing was I’d done a lot of work in the communities, working for Vincent Fort and doing other community service." "I encourage young people to just jump into it. Don’t think you need to be 45 and have a 401k. There is never going to be a perfect time.I didn’t think I would run for office at 27, but I’m glad that I did. If young people get elected, there’s less baggage. There’s more wide-eyed optimism. You see the world differently." In November of 2016, 72% of Atlanta voters approved a half-penny sales tax — expected to raise $2.5 billion over the next 40 years — in order to expand and improve public transportation in Atlanta. Recently, MARTA released a list of proposed projects which has elicited strong opinions from many residents. On Wednesday Ben Limmer, MARTA’s assistant general manager in charge of planning, joined us to discuss the project list and answer questions from community members. 1. The More MARTA expansion is a once-in-a-generation opportunity. As Ben Limmer explained, “we only get to do this once and we gotta do it right” — with the first sales tax increase in the City of Atlanta since collection started in 1972. For the past several years, Atlanta has been consistently ranked as one of the cities with the highest levels of income inequality and the lowest levels of income mobility. Because the areas where low-income people live and the areas where low-income jobs are concentrated are often far apart, safe and convenient public transportation is a crucial part of any plan to address inequity in Atlanta. 3. There is no one solution. MARTA’s project list includes Bus Rapid Transit (BRT), Arterial Rapid Transit (ART) and Light Rail Transit (LRT), as well as increased frequency on existing routes, especially during non-rush hours and on the weekends. 4. Our transit wish-list is bigger than our budget. While the list of potential projects released before the sales tax referendum includes $11 billion of projects, the sales tax is expected to raise $2.5 billion over the next forty years. MARTA does expect to receive money from the federal government — current plans assume the Feds will pick up the tab for 50% of the light rail budget and 80% of the BRT budget. MARTA is also exploring potential innovative financing opportunities, like public-private partnerships. Still, not every project will make the final cut. 5. 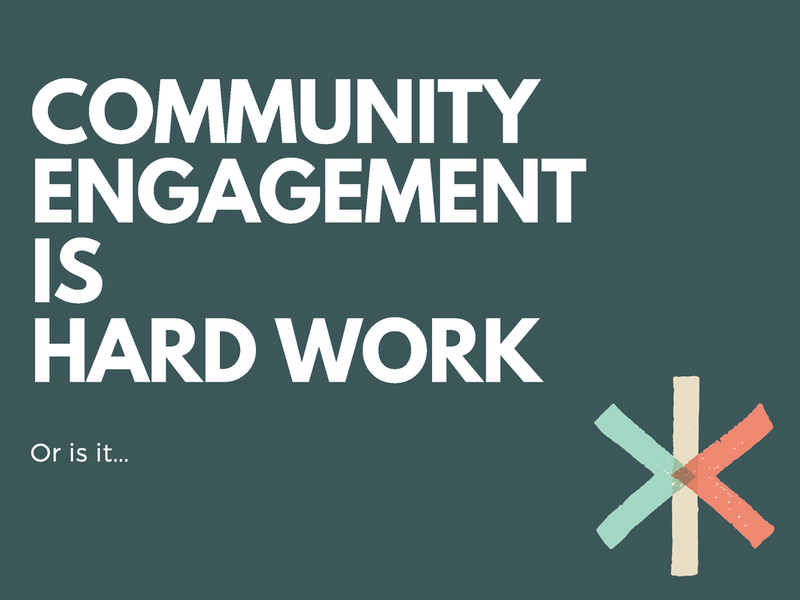 Community engagement is a long process. Wednesday wasn't the first meeting and it won’t be the last. MARTA engaged the community both before and after the sales-tax referendum (including an event at CCI! ), and held over 40 meetings and collected 4,300 survey responses in 2017. Now, after releasing the project list, MARTA is collecting a third round of public input. Ben Limmer emphasized that the current project list is not final: Everything is on the table. Overall, Atlanta residents have very strong and differing opinions on what should be prioritized, especially around the BeltLine (the released project list includes some, but not all of the original proposed light rail) and the Clifton Corridor, as Emory did not join Atlanta until after the referendum. Love cool maps of Atlanta? Want the wonky details? See the presentation slides from the event here. Check out MARTA’s More MARTA page here. You can the list of MARTA's scheduled public engagement opportunities here. 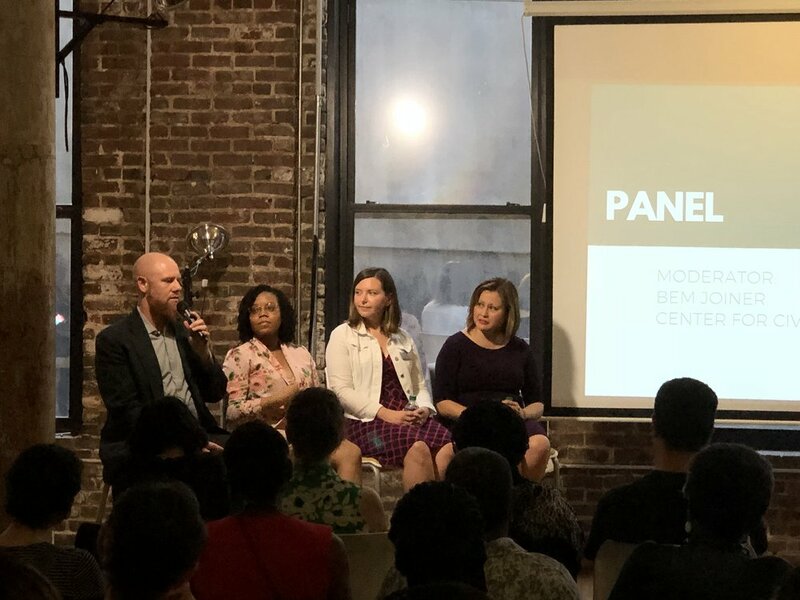 We will be following up with MARTA’s staff on a few things that came up at the event including our questions about open sourcing the data from the More MARTA surveys and the idea of a citizen’s council to help residents be connected during planning for MARTA projects. Stay tuned for updates on that! As mentioned by an audience member, the Atlanta City Council reviewed and approved the initial project lists in 2016 for MARTA and TSPLOST. The legislation that allowed the More MARTA tax requires City Council to approve a list of potential projects that would then go through a review process to create a final project list. We are currently in the review process. MARTA published a report on its initial outreach survey in October 2017. This information was used as part of the review process to create the current proposed MARTA project list. We have requested the raw data from MARTA and will work with them to see if that data is available and can be released. Two very specific projects seem to be top of mind for many attendees: the Clifton Corridor and the full Beltline loop. The full proposal for Clifton Corridor can be found here. The full list of Atlanta Beltline transit projects can be found here. Did you know Atlanta has a long-term plan for its transportation future? Atlanta’s Transportation Plan is in-progress the comprehensive transportation plan currently being prepared by the Department of City Planning and is available here. The document covers the current conditions and future ideas to solve some of the City’s most pressing transportation needs.The transit portion of the plan starts on page 32. The last comprehensive plan to be adopted was the Connect Atlanta plan which was adopted in 2008 with several updates added in recent years. This plan focused on solutions including transit, sidewalk, and road upgrades to solve Atlanta’s transportation issues. In addition to these resources, the Atlanta Regional Commission also has the Atlanta Region’s Plan, a comprehensive transportation plan for the entire Atlanta region. In 2018 the Georgia state legislature voted to create “the ATL” a new regional transit authority for Atlanta. The Atlanta Regional Commission has a good overview of what this means for Atlanta and MARTA. A few questions asked at the event focused on the potential of transit investments to change the socioeconomic makeup of a community. The Housing Justice League, a local housing advocacy group, created a report on the Beltline and its impacts on communities. The full video from the forum is on our Facebook page, but you can click here to go ahead and relive the forum or share it with the world. You can also click here to check out our recap of the evening to find highlights, key dates, and additional resources and information you need to know. 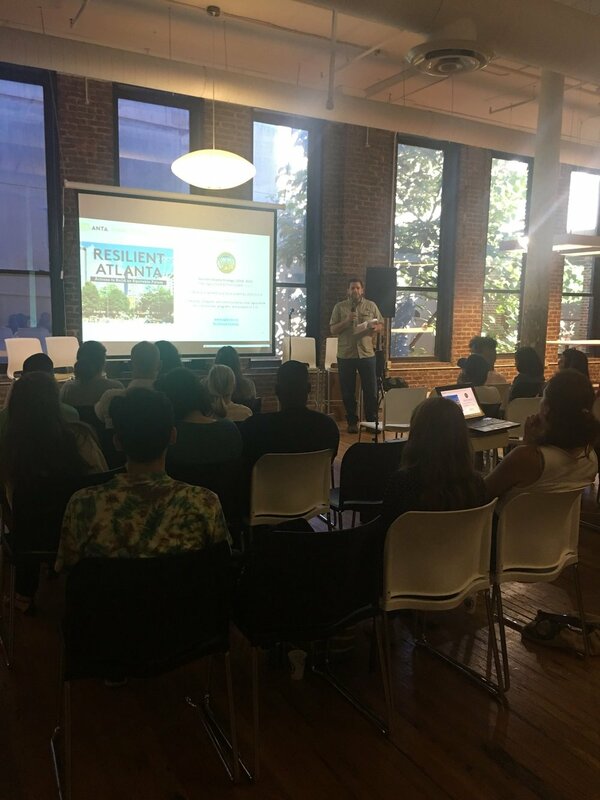 Last Wednesday, Mario Cambardella, the City of Atlanta’s Urban Agriculture Director visited the Center for Civic Innovation to speak about the AgLanta “Grows-A-Lot” program. Starting in 2016, CCI and Cambardella hosted a series of events where people and organizations that want to grow and access food could identify barriers and discuss what kinds of city policies would be most helpful in overcoming those barriers. During these discussions, participants identified access to land, information, and resources as their greatest challenges, and proposed land grants, farming opportunity zones, a NPU food access survey, and a food hub where produce could be processed and marketed as potential solutions. With this information, Cambardella and his department designed the AgLanta “Grows-A-Lot” program, which invites entrepreneurs, non-profits, and residents to apply for a 5-year renewable license to adopt a vacant, city-owned property to start a new urban garden or urban farm. In addition to land, selected urban farmers and gardeners will receive assistance with the permitting and insurance process; Cambardella also secured funding from the City of Atlanta to provide each farm and garden with its own water meter. Watch the entire event here! Applications are currently open and due Thursday, June 14! For more information about the program, including application requirements, visit the AgLanta Grows-A-Lot program page. If you couldn’t make it to Friendship Baptist Church last Tuesday for the BeltLine’s Quarterly Briefing, look no further: We’ve written a recap just for you! It was standing-room only as more than 300 community members attended the briefing to hear project updates, ask questions, and listen to a panel discussion concerning equity on the BeltLine, led by the Center for Civic Innovation’s Executive Director Rohit Malhotra. Panelists included Mayor Keisha Lance Bottoms; Odetta MacLeish-White, Managing Director of the Transformation Alliance; Brian McGowan, President and CEO of Atlanta BeltLine, Inc. (ABI); Tim Keane, Commissioner of the City of Atlanta Department of Planning; and Brandon Riddick-Seals, interim Executive Director of Atlanta Housing. After brief introductions from Beth McMillan, Director of Planning and Community Engagement for the Atlanta BeltLine, Atlanta City Councilperson Ivory Lee Young, Jr. (District 3) and Councilperson Cleta Winslow (District 4), Sadie Dennard, a deacon of Friendship Baptist Church, welcomed the audience and shared a bit of the churche's long history. The Atlanta BeltLine then shared project updates including new hires and material progress in a the form of an 11 minute video. Following project updates, community members were given an opportunity to ask questions. Displacement and affordable housing were key areas of concern, as community members challenged the Atlanta BeltLine to uphold promises. Rohit Malhotra introduced the the panel, promising “to make sure the voices in this room are heard in an effective way, but also to make sure this conversation also moves forward.” To do so, he asked panel members to set clear goals so the public could hold them accountable. Panelists moved beyond rhetoric, explaining the rationale behind policies, addressing past missteps and shared how they planned to better address equity and affordability in the future. For example, McGowan said that once ABI became focused on “building the BeltLine, I think we lost sight of people and community. The project itself is about people and community. It always was. This is a community and economic development project.” Commissioner Keane expressed how difficult it is to address inequity, yet offered some room for hope. After a conference with western cities in Seattle, he concluded “Atlanta is thinking more out-of-the-box right now than any of those cities.” Odetta MacLeish-White, in her role as Managing Director for the TransFormation Alliance works with various community organizations in Atlanta and around the country, expressed that “folks are very concerned… We need more specificity on definitions. We need to know what are the tools and the strategies that will be put in place to keep myself and my family where we laid our roots down.” Malhotra then challenged Riddick-Seals to explain how he defines affordable housing and area median income (AMI). Riddick-Seals explained that “our dollars that we use and the tools that we have are based on the metropolitan statistical area,” which includes Marietta and Sandy Springs and is set by the federal government. You can watch the whole meeting above. The panel discussion starts at 1:22. A Chicago native, Eriana is a rising junior at Georgetown majoring in African American Studies and double minoring in Sociology and Justice and Peace Studies. This city girl embraces her inner tourist mentality when going to any new place. She’s ready to get lost in everything food and must sees in ATL. At the Center for Civic Innovation, she will be working with Dayle and Alex on the happiness team. “It’s the little things that never in a million years you’d notice...that keep the staff happy.” In the first week, Eriana has developed a newfound appreciation for the attention to detail from the snack bins in the kitchen to how the couches are aligned to make sure everyone is comfortable. She loves working behind the scenes and wants to know all the ins and outs of CCI. Originally from Dayton, Ohio, Jan is a rising junior at Georgetown University studying Science, Technology, and International Affairs. It’s his first time in the deep south for an extended period and he’s already felt the warmth– both the expected “Hotlanta” weather and the southern hospitality. One of his main summer goals is to get on one of the new Bird Scooters and ride around the city. At the Center for Civic Innovation, he will be working with Rohit and Melonie to enhance the center’s public programming and fellowships. He’s ready to get to know each member of the CCI staff. “They’ve all had whole careers before coming here,” he says. Getting to know each of their backstories and understanding how their journey has led them to CCI. Originally from Trumbull, CT, Josh is a rising senior at Georgia Tech studying Industrial Design. Josh is looking forward to another summer in Atlanta exploring neighborhoods like Buford Highway, South Downtown, and Candler Park. Additionally, Josh looks forward to attending summer festivals in Atlanta, particularly the annual Atlanta Grilled Cheese Festival. At the Center for Civic Innovation, Josh will be working with Andrea in communications, developing innovative visual communications; he is especially excited to develop GIFs for the Center. Josh is passionate about graphic communication and loves CCI’s visual language. Overall, Josh is most excited to get to know the staff, fellows, and residents at the center, as he finds their unique backgrounds and journeys particularly inspiring. Born and raised outside of Boston in Wellesley, Massachusetts, Kell is a rising sophomore at Georgetown University studying Science, Technology, and International Affairs. Kell’s only time in Atlanta prior to this summer has been spent in the airport, so she’s looking forward to getting to know the city. At the Center for Civic Innovation, she will be working with Rohit and Melonie to enhance the center’s public programming and fellowships. She’s excited to learn how different organizations operate on a day to day basis through CCI. After her first event at CCI, Kell was impressed by the large and diverse community that was engaged in the event. So far, she has been surprised to learn how young CCI was since its impact on the community is striking. The only international CCI intern of the summer, Marina is originally from Russia. She’s in Atlanta working on her Masters in Public Policy at Georgia State. It’ll be her first summer in Atlanta and she’s really looking forward to all of the festivals that are going on each week, specifically the Atlanta Symphony Orchestra’s performance in Piedmont Park. At the Center for Civic Innovation, she will be working with Kyle and Melonie to enhance the center’s programming. She’s excited to work on the content and problem solve. She’s fascinated by CCI’s company culture and the environment they’ve fostered. She’s become very interested in different forms of public engagement aside from general meetings and hopes to learn from different speakers at the upcoming events. Rebecca is a junior at Brown University studying Economics. Rebecca is CCI’s only Atlanta native intern. Each summer she looks forward to the Atlanta Ice Cream Festival in Piedmont Park and running the Peachtree Road Race. She’s also excited to be home over the summer to spend time with her family and their newest member: a Bernese Mountain Dog/Poodle mix. Rebecca will be working with Andrea on the communications team. She’s hoping to learn how problems are solved at the center since it's not like conventional non-profits. She’s excited about CCI’s network and plans to learn a lot from the different people that speak at events throughout the summer. “Everyone here is cooler than me,” she claims. Her expectation for “cool kids vibes” has certainly been met. CCI team member Kyle Kessler introduced the topic, emphasizing that community engagement is a spectrum that ranges from informing the community and inviting the community to participate, to empowering the community to make decisions. Later, CCI team member Bem Joiner introduced the panelists, who worked to engage the Atlanta community on projects such as the Atlanta Beltline, the Better Together Decatur campaign, and the Downtown Master Plan. After Kyle and Bem's introductions, participants all gave short presentations on their experiences and challenges engaging their communities, such as including difficult-to-reach communities, and the resources needed for successful community engagement. You can download Kyle's presentation here. Panelists include from (left to right) Nathan Soldat and Whitney Fuller (Community Engagement Managers at Atlanta BeltLine), Audrey Leous (Project Manager, Planning and Urban Design at Central Atlanta Progress), and Casie Yoder (Casie Yoder Consulting and Former Chief Spokesperson for City of Decatur). Whitney Fuller describes how she moved to a neighborhood adjacent to the beltline to better understand her community's interests. Audrey Leous described how Central Atlanta Progress hosted several open houses at Georgia State, where community members could interact with maps and photo boards, explaining how she tried to move past the old meetings model to make community engagement exciting and, well, engaging. Cassie Yoder who led the Decatur Together Campaign explained how communities have the most influence during the first stages of any project, but often only become engaged once construction begins in their backyard. Additionally, she highlighted the importance of community engagement managers who look like the community, live in the community, and have similar lived experiences as community members. Finally, panelists expressed how crucial resources are in leading a successful community engagement process. Audience members asked the toughest questions, challenging the panelists to work more closely with community organizations, and asking why projects sometimes do not look like what communities agreed to. Panelists explained the challenges of financial and political constraints, as well as the difficulties of keeping community members involved during the implementation phase. Charnette Trimble, Civic Innovation Resident at the Center for Civic Innovation and long-time community activist, challenges the panelists: Why do projects often look nothing like what the community agreed to? At the end of the event, panelists encouraged audience members to stay involved. On June 4, the Beltline will host its quarterly briefing meeting 6-8:30 pm at the Friendship Baptist Church. Central Atlanta Progress recently formed a Downtown Master Plan Task Force and encouraged community members to join and sign up for its listserv to stay informed. On May 10, 2018, the Center for Civic Innovation (CCI) once again teamed up with Sara Blakely, founder and CEO of Spanx, to invest in eight women entrepreneurs with products, services, and programs that solve civic and social challenges in Atlanta.